Carlsson C25 Royale special edition which coming from extensive modifications of Mercedes SL65 AMG has been presented at Geneva International Motor Show. The modifications include on the engine, interior, and also on its chassis. With a tuned V12 biturbo engine, Carlsson C25 Royale special edition may develop its power up to 753 hp (554 kW) and 1,320 Nm of torque. With a 0 to 100 km/h (0-62 mph) acceleration time at 3.7 seconds, Carlsson C25 Royale special edition's top speed is rated at 352 km/h. Carlsson C25 Royale special edition will features new aerodynamics, bigger brakes, and also a lower and stiffer suspension system. With only one car will be sold per country, Carlsson C25 Royale special edition will become the most exclusive vehicles in the world for a price of 429,000 Euro net export price. As part of its new 2011 generation range, automobile manufacturer Carlsson presents its C25 Royale Super GT with carbon roof and exterior, optimised driving dynamics and perfected electronics. The philosophy remains the same: with excellent design and the utmost in exclusivity, the Carlsson C25 Royale special edition combines maximum driving performance with everyday practicality. Safety is another area where the Carlsson C25 Royale special edition fulfils highest standards. This is due to the crash structure which is the same as in the basis model and guarantees maximal protection for the passengers. Also, the Super GT presents itself extremely easy to service. All workshop of the worldwide Mercedes-Benz service network can service the Carlsson C25 Royale special edition. 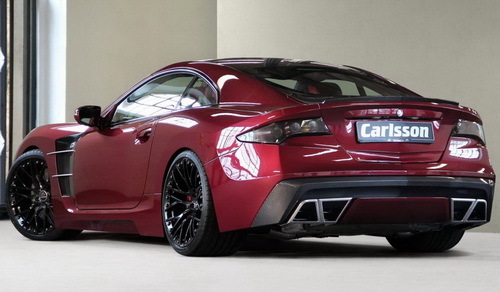 The Carlsson C25 Royale special edition presents itself as a counter-design to the electro hype. More than 40 electric motors are used in the Carlsson C25 Royale special edition as well - but underneath the bonnet you’ll find a traditional 12-cylinder engine, whose 753 hp ensure not only power but also thunderous drive. The purified exhaust gases make an impressive sound as they exit through the four diamond-shaped tailpipes into the open air. The breathtaking power pushes the driver into the ergonomically shaped seats, which have a massage function and a ventilation system to ensure greater comfort on long journeys. In addition, the transmission tunnel, incorporating all the important control functions, is headed towards the driver, allowing him to give his full attention to the road ahead. Because in the Carlsson C25 Royale special edition, the journey is its own reward. Carlsson has realised more than 70 innovations in the new Carlsson C25 Royale special edition. The car’s handling in particular is better than ever before. 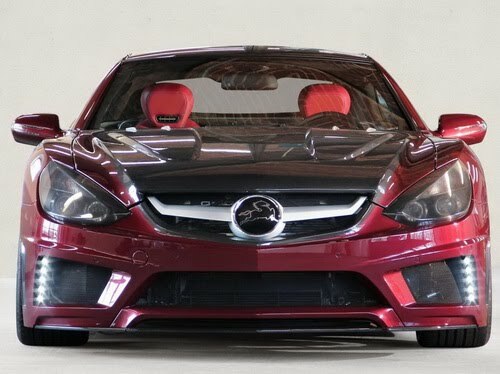 Plus, compared to the basis model Mercedes-Benz SL 65 AMG, the C25 Royale is 180 kilogram lighter which is due largely to the complete real carbon exterior. This not only reduces the overall weight of the Super GT, it also effectively lowers the car’s centre of gravity and allows more dynamic cornering ability and more agile handling as Carlsson has revised the vehicle’s entire weight distribution and installed a differential lock. The full ceramic brake system reduces the weight by 50 percent and reduces the unsprung mass for a more dynamic handling. The generously designed ceramic brake discs and the solid aluminium callipers allows later braking coming into bends while the revised electronics guarantee improved response, giving greater dynamism when coming off bends. The C25 Royale’s outstanding performance data is impressive too. The strikingly beautiful sports coupé with the V12 biturbo engine achieves 753 hp (554 kW) and maximum torque of 1320 Newton metres (which is limited electronically to 1150 Newton metres). This allows the Super GT to race from 0 to 100 kph in just 3.7 seconds and to achieve a maximum speed of 352 kph. In particular, the intelligent C-Tronic® SUSPENSION developed by Carlsson guarantees excellent ride comfort. This system measures a whole range of parameters, like the spring rate, on a continuous basis, which allows it to detect the road conditions and the driving style. Where road conditions are poor, the C-Tronic® raises the residual spring travel, thereby providing optimal ride comfort. As soon as the surface conditions have improved, the system will lower the entire suspension completely automatically and achieve perfect cornering dynamics. The twelve-cylinder reflects the company’s performance capacity and competence. Carlsson emphasises on first-class engineering instead of immature technology, on daily suitability instead of utopian scenarios, on emotions instead of sacrifice. With the Carlsson C25 Royale special edition, Carlsson has gone one step further on the road to developing a completely new class of vehicle. No other car manages to combine excellent driving performance, unique design, perfect everyday practicality and the utmost in exclusivity.